Bundesliga | Borussia Dortmund vs. Bayern Munich: Vote for YOUR Klassiker dream team left winger! Borussia Dortmund vs. Bayern Munich: Vote for YOUR Klassiker dream team left winger! Ahead of the first Bundesliga Klassiker of the season, bundesliga.com is giving you the chance to vote for your Bayern Munich-Borussia Dortmund dream team. All 11 positions are up for grabs, and it's your votes that will determine the final combined Bayern-Dortmund XI, which we will present to you ahead of Saturday's big match. 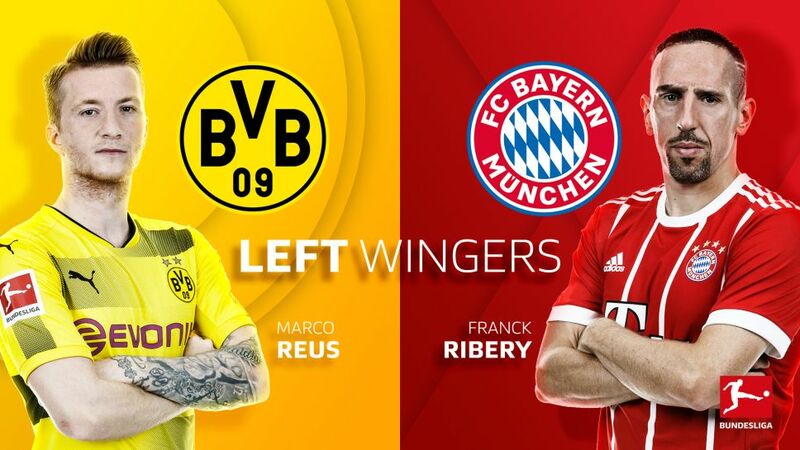 Here are the four candidates for the left wing position: Kingsley Coman, Maximilian Philipp, Marco Reus and Franck Ribery. Cast your votes in the poll below! Now in his third season with Bayern, the French winger is beginning to show his full potential with plenty of game time being backed up by a string of consistently impressive performances. Having been in competition with the evergreen Ribery for that starting position on the left, he found playing time limited. Now he has featured in all but one competitive game this year after signing permanently from Juventus, having a hand in five goals during his 15 Bayern appearances in 2017/18 and despite being just 21 year of age, he already has five league titles to his name. More than some of his much senior teammates. A summer signing from Freiburg, Philipp has almost immediately settled into life at Dortmund under Peter Bosz. The 23-year-old has been an integral part to Borussia’s flying start to the season with five goals and two assists in his nine Bundesliga appearances this term. It has been an electric start from the winger, who has already begun to repay BVB for bringing him to the Signal Iduna Park. Rested for the game against Hannover, Philipp is primed to make his first Klassiker appearance in the Bundesliga following one minute of action in the Supercup earlier this season. Now a Dortmund veteran in his sixth season with the club, Reus’ talent is undeniable with a goal almost every other game for his club, as well as over 60 assists in over 180 appearances in yellow and black. Included in that was a phenomenal 90 minutes where he scored three and assisted two on his first appearance in several months against Legia Warsaw. They are performances that saw him earn a place on the cover of FIFA17, although a constant string of injuries has curtailed his efforts at playing consistently well at the highest level. A man who needs little introduction after a decade with the record champions. The Frenchman has won it all during his time in Munich: Seven Bundesliga titles, five DFB Cups, the UEFA Champions League and more. The personal accolades have also flowed freely during the last ten years, including the French Player of the Year, the German Footballer of the Year, the 2012/13 Bundesliga Player of the Year and was the top assist provider in the Bundesliga for back-to-back seasons in 2011/12 and 2012/13. Currently sidelined until 2018 with knee ligament damage, his injury has opened the door to Coman but a fit Franck Ribery is almost a must in any team.